The name given to the type of residence that had evolved by the end of the 14c for the abbot, i.e., the head priest of a Zen temple. Characteristics of the Japanese residential style *shinden-zukuri 寝殿造, developed during the Heian period and of *shoin-zukuri 書院造, developed from the residences of the warrior class *buke-zukuri 武家造 from the 14-16c, were incorporated into the dwelling. The plan of the houjou evolved from the rectangular *menzou 眠蔵, living quarters for the superior of a subsidiary temple *tatchuu 塔頭, used for sleeping, resting, reading etc. During the early 15c this rectangular area was divided into six rooms, arranged in two rows, three rooms across the front and the back on an east-west axis. A wide veranda *hiro-en 広縁, and often a lower veranda *ochi-en 落縁, were built across the front. Regular verandas run along each side. 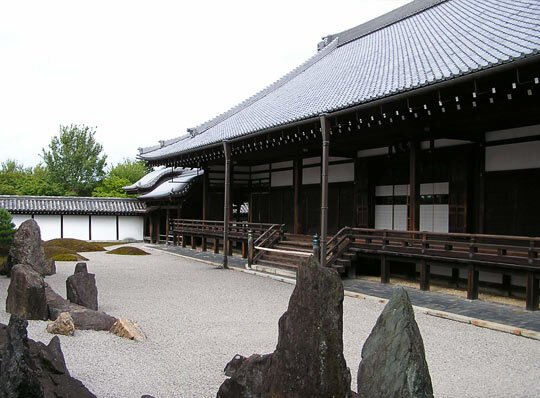 The entrance *genkan 玄関, has a hard packed earthen floor *doma 土間, and is located at the right end of the front verandas. The main central room on the front row is called shitchuu 室中 (also called naka-no-ma 中の間); on either side of this were narrow rooms, on the left the gentleman's or guest room, dan-no-ma 檀の間, on right the patron's room, rei-no-ma 礼の間. 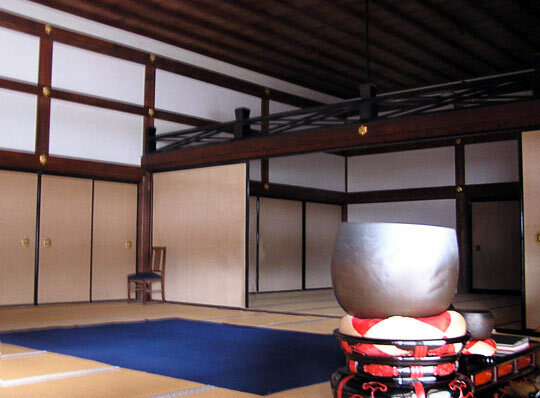 Behind the front row, the center rooms are for the priests' raiment, begging bowls and dressing, ehatsu 衣鉢, and the one to the right is the *shoin 書院, with an alcove *tokonoma 床の間, shelves *tana 棚, and a desk, tsukeshoin 付書院. 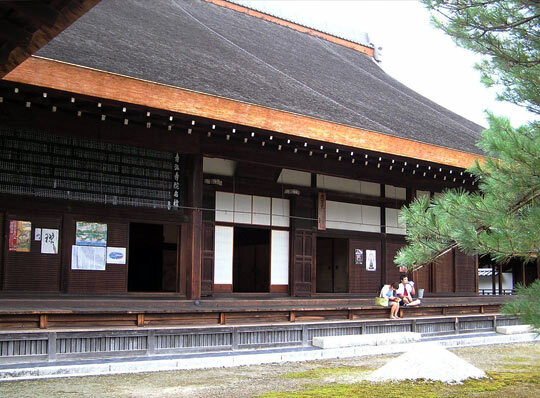 In a very large Zen temple, there is usually a need for two high priests' buildings. One is called daihoujou 大方丈 (also sotohoujou 外方丈 or maehoujou 前方丈) and the other is the kohoujou 小方丈 (also uchihoujou 内方丈). The main central room and the room for the Buddhist altar have plank flooring. The remaining rooms have straw mats *tatami 畳. Rooms are divided with opaque sliding screens *fusuma 襖, many beautifully decorated with paintings. The main entrance has double leaf folding doors called moroori sankarado 両折桟唐戸. Elsewhere, aside from paper sliding doors, are plank doors with rows of horizontal crosspieces attached at regular intervals *mairado 舞良戸. Examples: Myoushinji Daihoujou 妙心寺大方丈 (1654), 29.5m×21.7m, and Kohoujou 小方丈 (1613), 15.9m×10.0m.